Preheat oven to 375°F and grease a 9x13-inch baking dish. Bring water to boiling and add chicken bouillon cubes, lower heat and simmer till dissolved--keep it hot. Sprinkle chicken with half the spices (except the garlic). Heat the olive oil in a large skillet on med-high to high heat and fry the chicken till both sides are brown, lower heat to medium and remove the chicken to a plate. In that same skillet sauté the onions for 2 minutes, then add the garlic and remaining spices and sauté another 2 minutes, then turn off the burner. Add the rice and stir for about 30 seconds to 1 minute, till well coated. 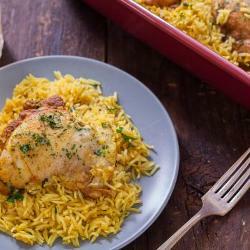 Spread rice in the baking dish and place the chicken thighs over the rice. Gently pour in the chicken stock and cover tightly with foil.